If you want hard-working value, look no further than the Honda Foreman 500. 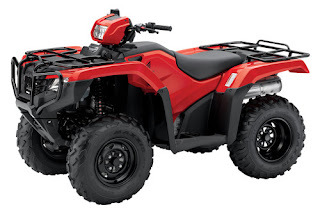 Each four wheeler in the lineup is unmatched, providing proven features like powerful 475cc overhead-valve engines with fuel injection, TraxLok with selectable 2WD/4WD and a dependable five-speed transmission. Need extra help when riding in ruts, over rocks or on long side hills? Then choose the model with Honda’s innovative Electric Power Steering (EPS) with the most breakthrough power steering ever experienced on a four wheeler. Both speed- and torque-sensitive, the EPS system gives the rider the right amount of assist in every type of riding situation including rough terrain. The TRX500FPM FourTrax’s steering assistance is computer controlled and also adjusts to changes in the ATV’s speed and drive selection. Sophisticated torque and speed sensors measure how much force riders are applying and then tailor how much extra assist is needed. As speed increases, the amount of assistance is reduced to allow the appropriate level of feedback. Plus, Honda FourTrax’s re-designed EPS system greatly reduces kickback through the handlebar in rough or rocky terrain to reduce riding fatigue even more. And three mounting points increase rigidity for a better feel, increased stiffness and enhanced control. Honda introduced the EPS system on the hard-working Honda Foreman 500 line in 2007, and it’s been a dependable, smart feature since then. With proven Honda engineering, EPS helps keep the feel of the steering consistent so it’s not too light or heavy, regardless of your speed or drive selection. The Honda FourTrax has always been the workhorse of the four wheeler world, the machine smart riders use to get the job done or take on the next great adventure. And for all-terrain maneuverability, adding the available EPS system just makes sense.